These comments were originally written as a complement of a footnote in chapter 12 of The Power of Stupidity, where (in the first Italian edition) I had made a silly mistake. I thought everybody knew the story of the scorpion and the frog. But some readers (who are not ignorant or poorly informed) told me that they didnt. So I understood that, just because we happen to know something, its wrong to assume that everybody else is aware of it. And, in any case, this little aesopian fable is worth some comment. Its origins seem unknown. There are no traces, in any tradition, that lead back to Aesop. No indications that it ever existed in Greek or Latin. Its around in several languages. It seems to have started in English, somewhat earlier than fifty years ago. But it may have an older origin in African folklore  the tale of a generous frog on the shore of the Niger river. This is the story. A scorpion wants to cross a river, but it cant swim. It asks a frog to help. The frog is worried, but the scorpion promises «I wont sting you, because if I did I would drown». In mid river the scorpion stings the frog. The dying frog asks «why?» and the drowning scorpion answers «thats my nature». One of the earliest known quotations is in a movie by Orson Welles, Confidential Report (1955  based on his novel Mr. Arkadin.) This tale, later, appeared in a number of articles, stories, movies and television shows (including an episode in Star Trek - Voyager, the Gilmore Girls sitcom and a series of Japanese cartoons.) There are some books (and websites) dedicated to this subject  that is quoted in several hundred thousand texts online. There are, of course, elaborations. What if the scorpion wants to kill the frog as soon as they get to the other side of the river? Or will the frog drop the scorpion in the water to eat it when its drowned? Or could both be eaten by a fish or a bird? Etcetera. But the true meaning of the story is in its simplest form. The concept is applied in all sorts of ways to analyses of history, or of recent events, on the dark side of human behavior. There are countless variations. In a Lebanese version, the scorpions final words are «My dear, this is the Middle East». And, of course, this could apply to several other places. There are infinite ways in which someone can be placed in the role of the scorpion  or the frog. In this irritating tale there is a disturbing truth: it really happens that people behave in incomprehensible manners with no other reason than, nobody knows why, that is their nature. There is no aesopian moral of this fable. Its strongest meaning is that it cant be explained. Its the essence of stupidity (harming others at ones own disadvantage) taken to its extreme consequences. A disease that lies deep in human nature. There are many examples, practically every day. We can laugh when they are just funny. But some are dismally tragic. The fact is that, in the Persian texts found so far, the tale is never the same as The Scorpion and the Frog. Only in some versions the scorpion dies  in none the turtle. There are no variants in which one or the other is suicidal or kills with no reason. Therefore the moral of the fable is totally different. 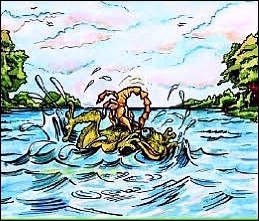 Its very likely that, in the complex scorpion mythology, origins can be found that  as it often happens with symbols, parables and fables  are shared by different cultures and deeply rooted in ancient tradition. But, when we are considering the power of stupidity, we need to keep the case of the suicide murderer separate from other stories involving a scorpion (or, with the same symbolism, a snake) as well as those in which the frog is the killer and doesnt die. The tale and the moral are completely different also in The Tuna and the Dolphin. The dolphin chases the tuna. In the fury of the hunt and the escape, both are shored on a beach. The tuna, while sorry to be dying, is happy that so is its enemy. Though there can be apparent similarities, none of the snake stories, such as the several different versions of The Farmer and the Snake, leading to a variety of results, have the same meaning as The Scorpion and the Frog. Of course there are many fables, in all sorts of traditions, in which the consequences of a mistake or a cheat are defeat or revenge, submission or treason, cruelty or compassion, undeserved suffering or an unexpected happy ending. But, as far as we can tell, The Scorpion and the Frog is the only one of its kind. From the remote origins of human culture to the daily events of our time, one of the most insidious forms of stupidity is that human beings (or, more broadly, living organisms) can do harm to others and to themselves for no understandable reason, just because its their nature.